Steve put me in touch with his friend Wade and Wade's daughter Jamie. 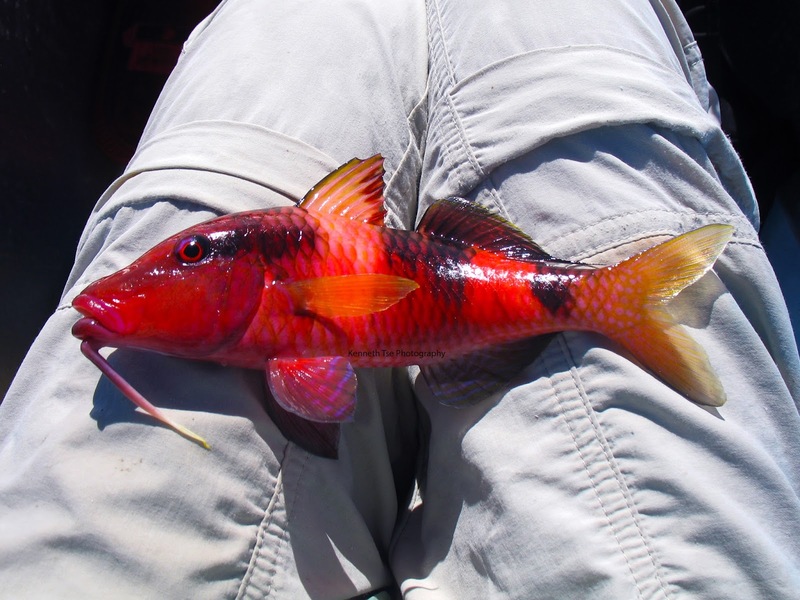 Jamie is a fantastic angler who is building her own collection of IGFA records from Hawaiian species. From reading Steve's blog, I was completely ready to be outfished on the day. 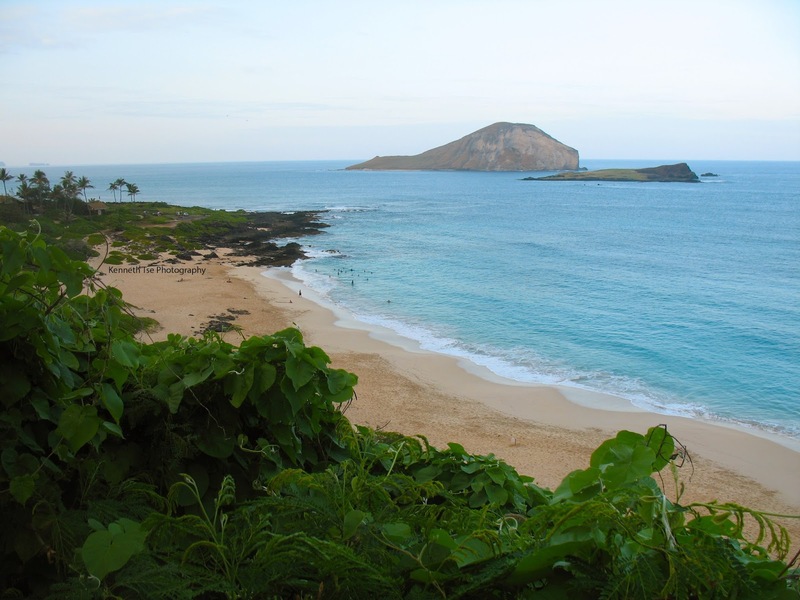 Wade introduced us to He'eia Kai. Early in the morning we saw a couple of schools of Yellowfin Goatfish (Weke Ula) that were actively feeding. I hooked and lost two, but Jamie managed to land two fishing next to me. Yep...outfished. People were chumming (palu) and fishing bread. We tried that for a while catching Yellowfin Surgeonfish and juvenile Palenose Parrotfish, but couldn't find anything else new. Wade suggested that we move to his beach spot to try for Sharpjaw Bonefish (O'io). While Wade and Jamie cast out two heavy rod for dunking, Michael and I complete the spread with lighter surf rods. Minutes after casting in, my surf rod tip quivered but then stopped immediately. 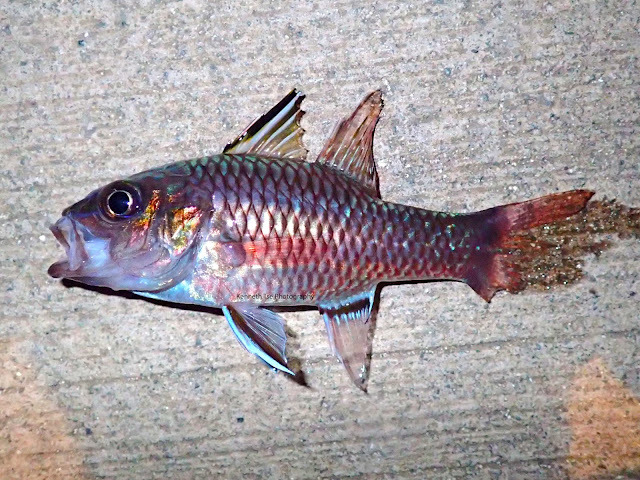 I thought it was a small fish that had hit and run. A while later, my line was finally brought in by the waves and I reeled in the check bait. 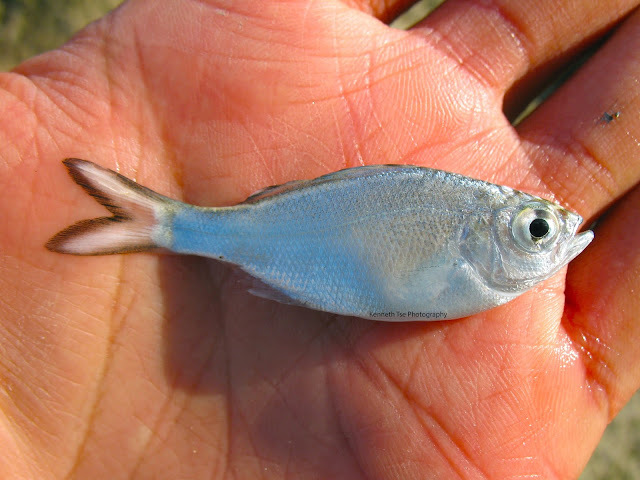 Unexpectedly, I felt a little weight on the other end and my jaw almost dropped when I saw the Sixfinger Threadfin (Moi) on the other end! It's only 10 days into the trip and I'm already up to 30 new species...and the 30th was a Moi! This felt quite surreal. We waited for the Bonefish bite for a few hours but none decided to bite that day. 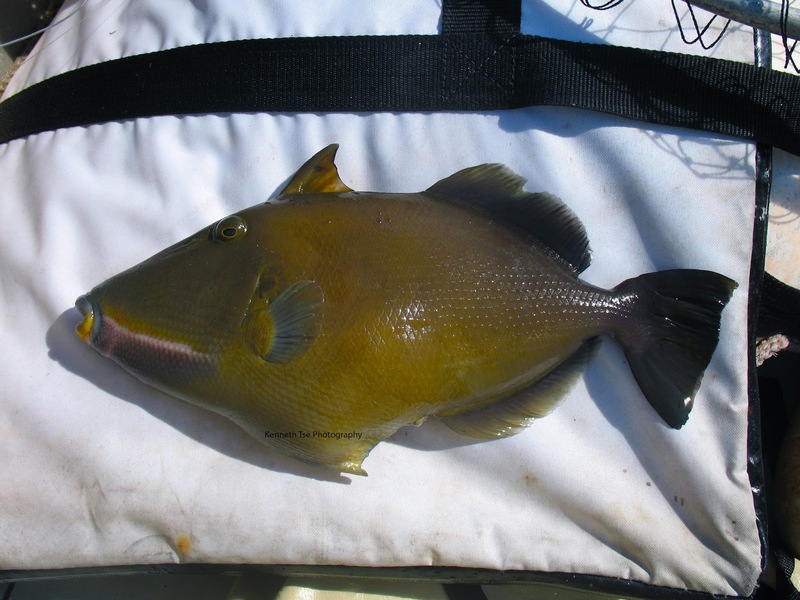 So we decided to fish Laie Point where we could try for Sea Chub Unicornfish again. Jamie and Wade had to leave by 2pm so they only stayed with us for 30 minutes. Michael and I fished until sunset. I tried for a few hours fishing bread on floater rig but I was simply feeding the fish. 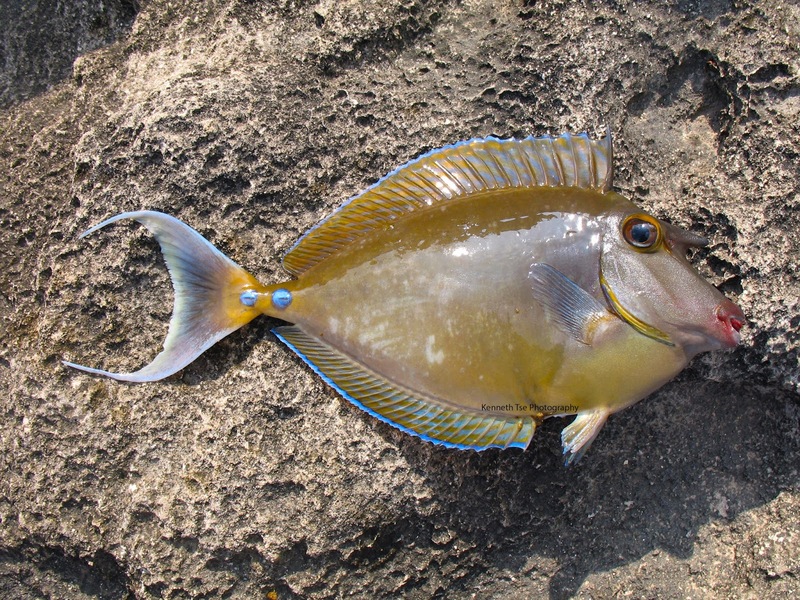 Michael did catch his own Bluespine Unicornfish and even a Hawaiian Chub. 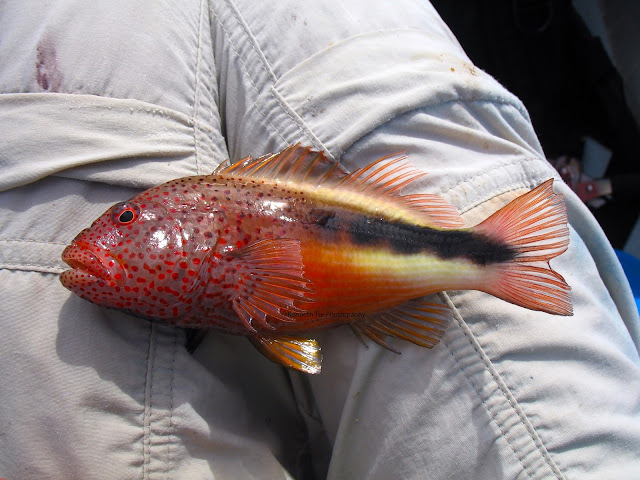 I got tired of repeatedly putting bread on the hook so I fished a micro fish finder rig and found a couple of Redbarred Hawkfish. I have caught this species in the past, but only had a blurry picture. Finally I have a better picture for the list! It was Saturday and Jason had the day off. 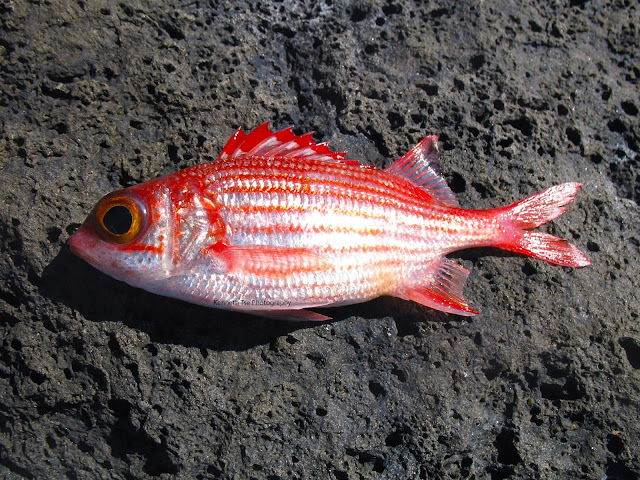 We went fishing with Jason and his friend Brandon on the leeward side of Oahu. We went to Turtle Bay for the morning session. While Jason and Brandon hiked way, way far whipping in the surf, Michael and I spent most of our time fishing in a tidepool. Yeah, I should have tried for Moi in the rough surf (in all honesty I did try for an hour) but those little fish in the tidepool were calling to us. 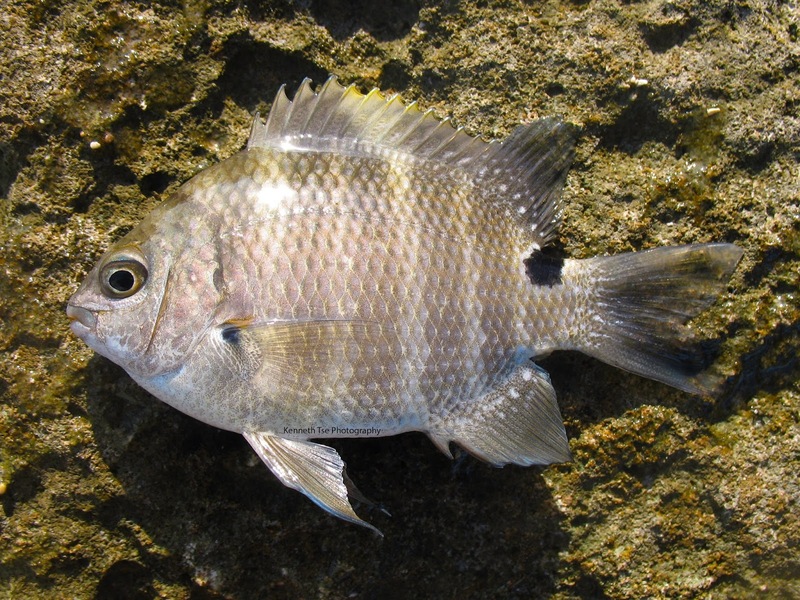 Although the Blackspot Sergeant (Kupipi) was not a new species, I needed a better picture of for the list. The Hawaiian Flagtail (Aholehole) were split into two distinct species a few years ago. In the past, I had actually caught both species and had Dr. Jack E Randall confirmed them for me, but I really wanted to document them properly on this trip. 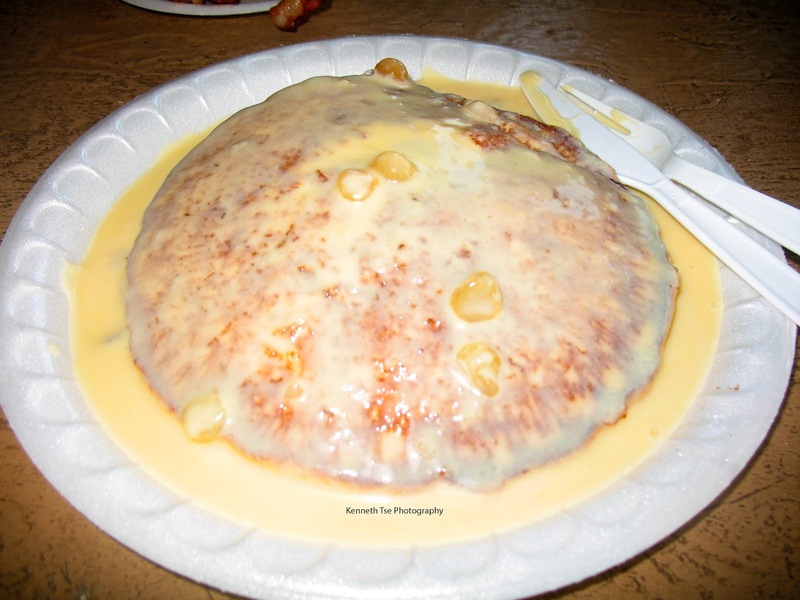 Perhaps the more difficult one is Kuhlia sandwicensis. 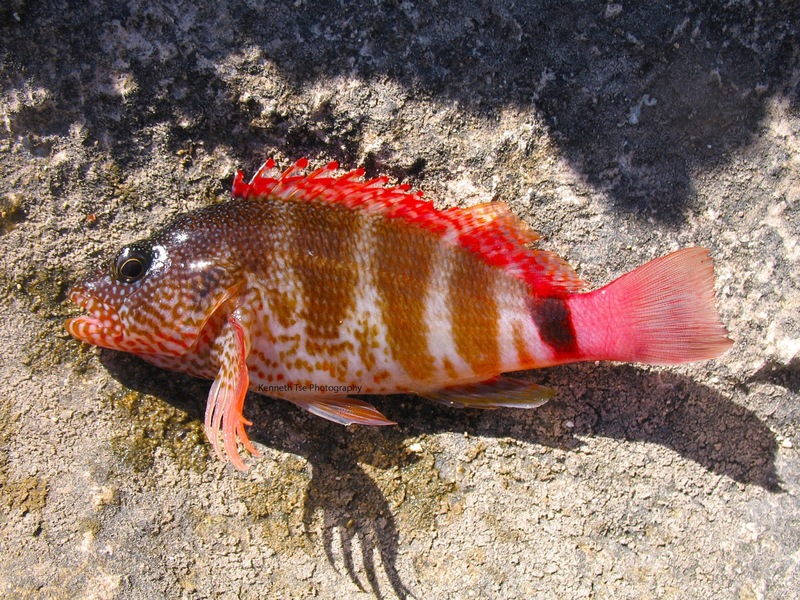 We found a number of them in the tidepool, so I finally got some documentation picture for the list. * Kuhlia sandwicensis is characterized by the thick black and white reticulated marking on the top of the head, which are especially define in the juveniles. 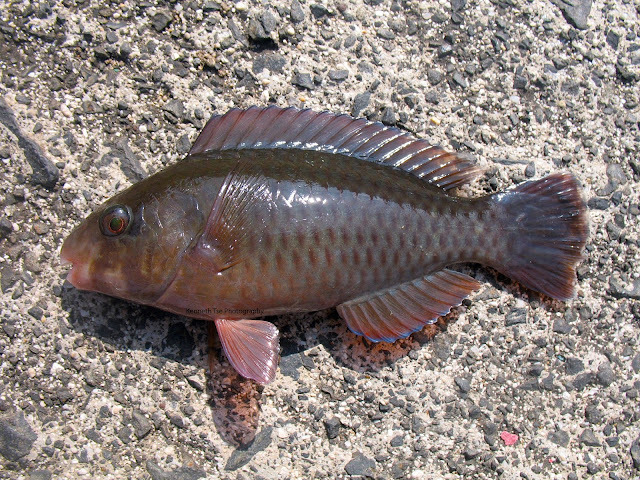 It also has smaller eye diameter compared to the related Khulia xenura (endemic to Hawaii). 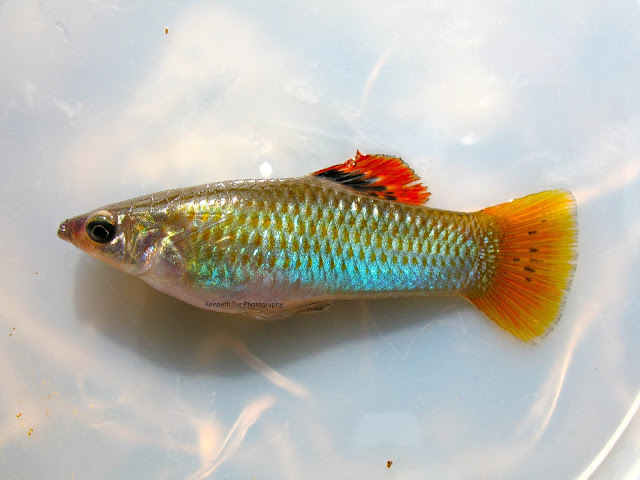 The common names are still to be decided on FishBase. Jason and Brandon returned and said they each caught a Manybar Goatfish but nothing else. Glad I didn't miss out on the absent Moi, haha! 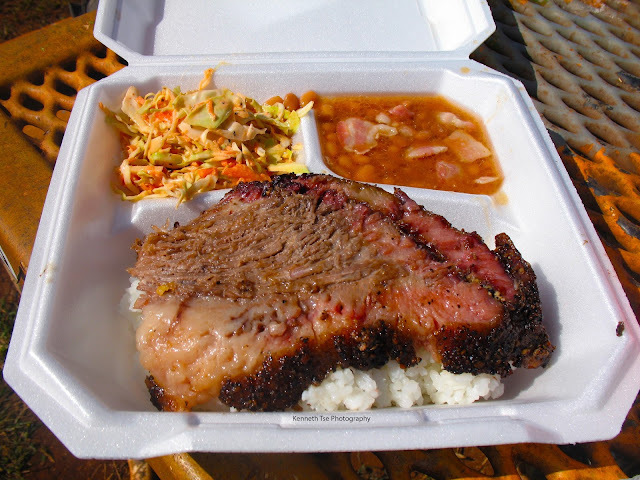 We decided to make a lunch stop at HI-BBQ. They sell smoked meat lunch plate out of a truck from a working ranch. Their smoked Beef Brisket was out of this world...broke da mout!!! It was so well marbled and the brisket was so buttery and soft it simply melted in my mouth. Look them up...you will NOT regret it. I would suggest their mix plate, which sells for $20, but you get to sample everything and it is WAY worth the price. I have to give a shout out to their service too. The guy taking order made a mistake and had my order delayed for only a few minutes, but decided that it was not acceptable and gave me a $5 refund. 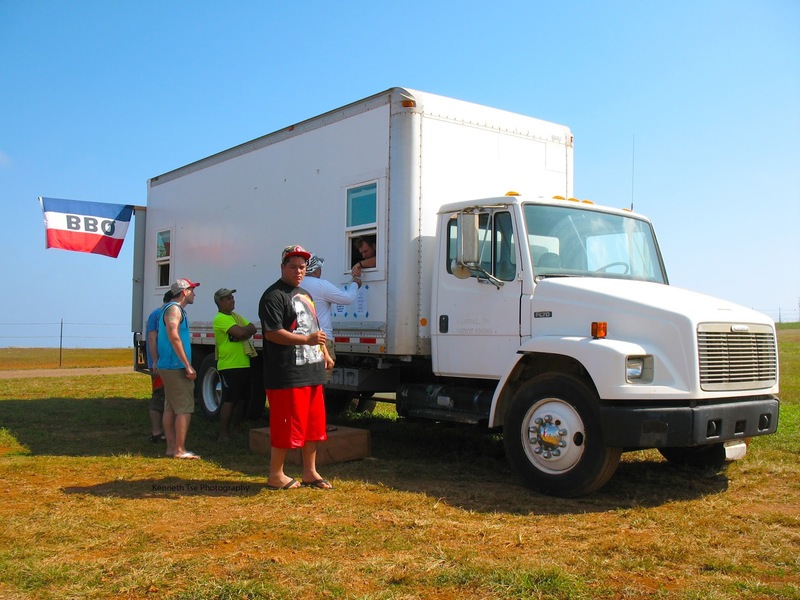 That's unreal service for a food truck! After lunch, we went to Laie Point to target Sea Chub (Enenue) and Unicornfish (Kala). I picked some Limu Kala (a species of seaweed) at Turtle Bay, but the ones growing in the shallows wasn't good enough. Brandon braved the surge and pick some darker Limu for me instead. Unfortunately, I only got one bite off the primo bait before the fish learned our tricks. We went to fishing bread on floater rig. 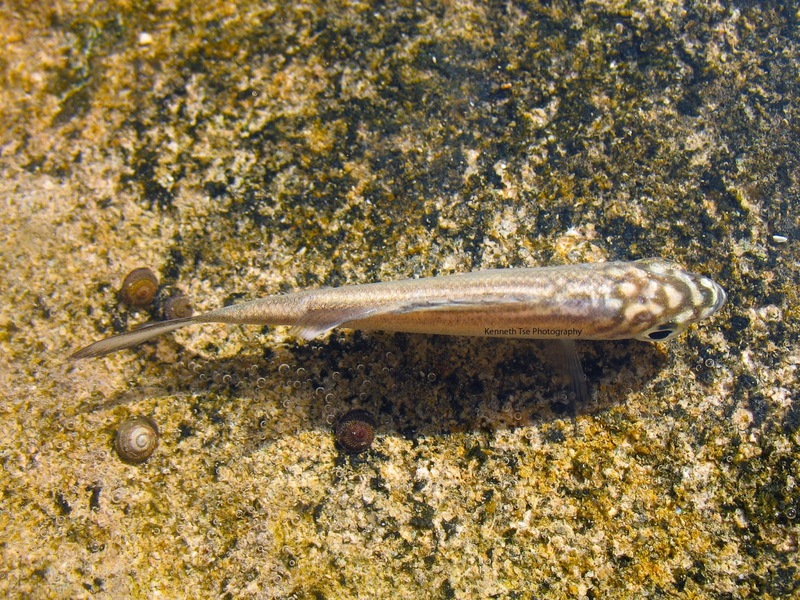 For most of the afternoon, we were merely feeding fish, especially the Keeled Needlefish (Aha), with our bread. After a few hours, the sun was dipping low and it was time for Jason and Brandon to leave. As a Hail Mary effort, I put on a big chunk of bait for a last cast when I finally got bit good and connected! At least one target was achieved! Taking advantage of the weekend, we went fishing for the night bite after having dinner at my Grandma's. Michael shone his light into the shallows and saw two Yellowstriped Goatfish (Weke) immediately. Although the fish spooked off, they were in the area so I tried chunks of shrimp for them. Instead, I got hit but a red coloured fish which caught me by complete surprise. We saw lots of smaller red coloured fish in the rocks. Some would peck at the bait cautiously, but we couldn't hook any. 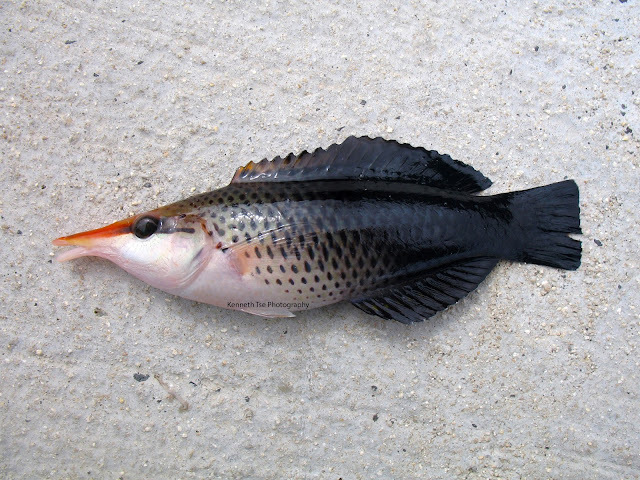 Instead, we found some Bandfin Cardinalfish instead. 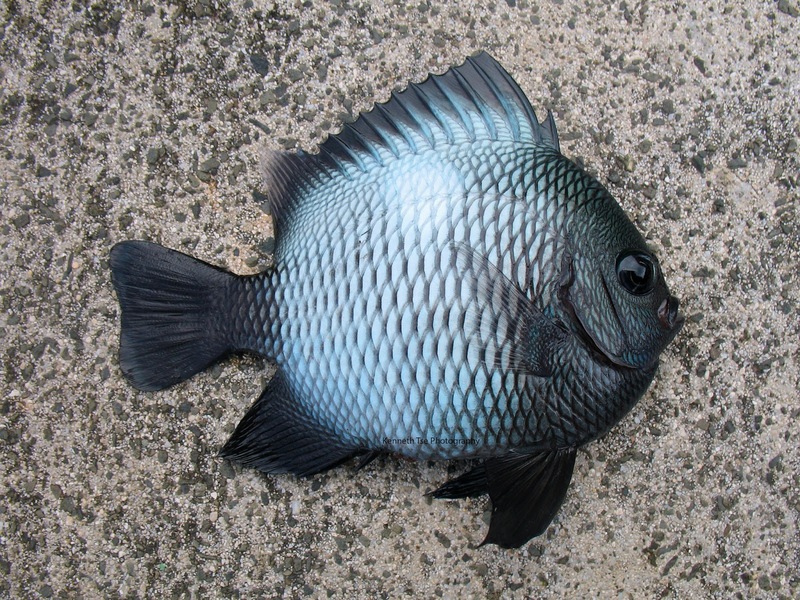 Mine looked like it was attacked by a predatory as the lower lobe of the caudal fin was missing. Michael arrived last night on a delayed flight. 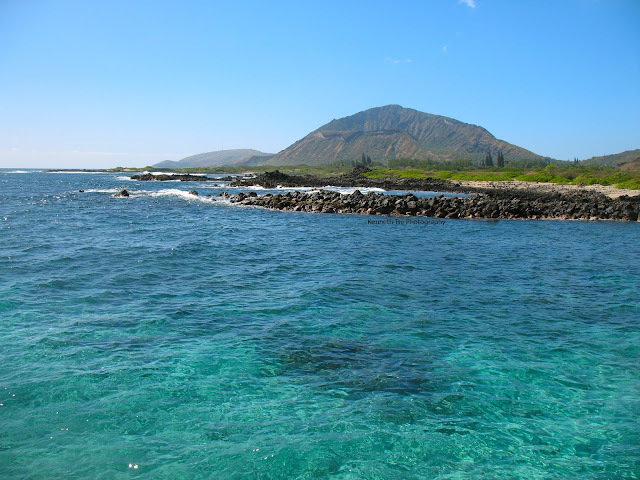 We got to a late start and fished around Makapu'u. Michael targeted a bunch of new lifer species that I had already caught, so I focused on those Moray in the rocks. I hooked into the big Undulated Moray twice. First time the fish rocked me, second time the hook was straightened out. Michael gave the same eel a go as well but the eel rocked him yet again. After the third time, the Moray went away. Here I was trying to pull the Moray out on a 30lb class trolling rod. It wasn't even close to pulling the Moray out of its hole. 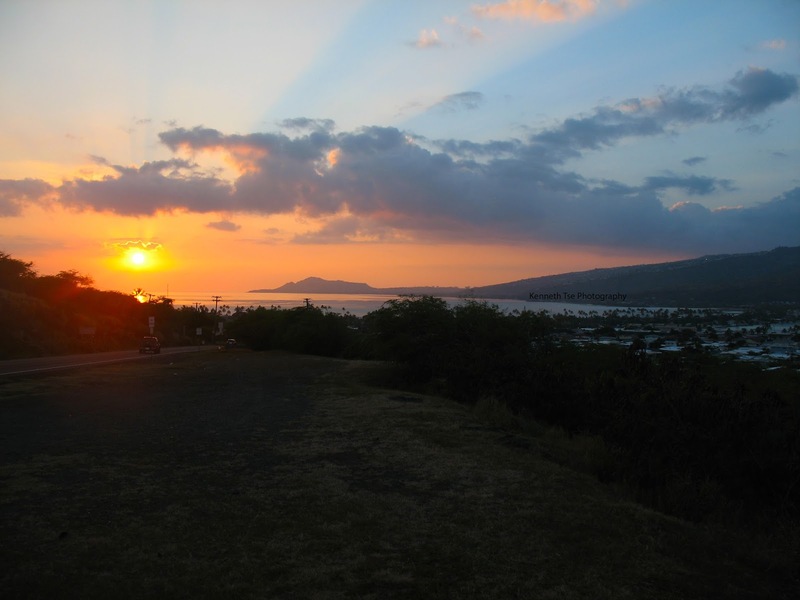 We then moved to Makai Pier so Michael can pick at more species. I fished bread hoping to catch the Bluespine Unicornfish, Orangespine Unicornfish and other herbivores. I caught lots of reef fish, Millet Butterflyfish, Threadfin Butterflyfish, Saddle Wrasse, Green Damselfish, Hawaiian Gregory, Hawaiian Dascyllus...etc...but none of the targets I wanted could get at the bait with all these bait thieves around. 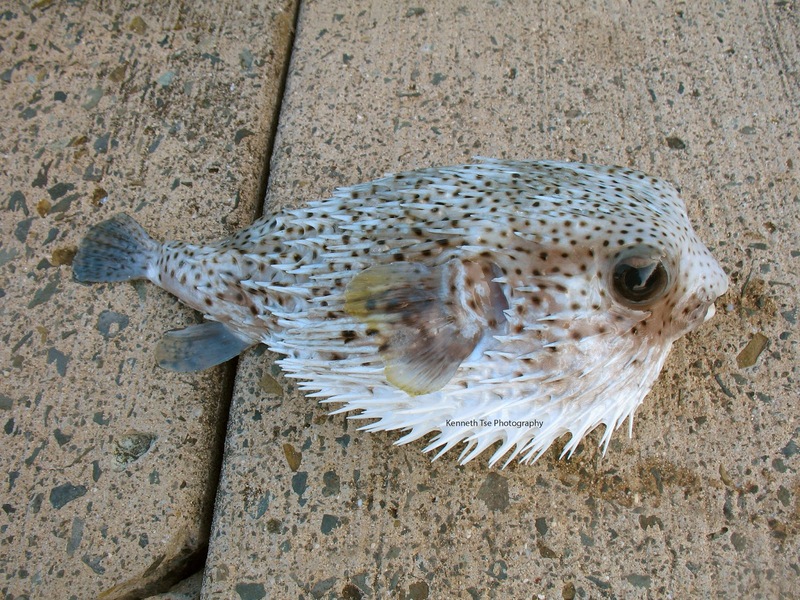 After a while, a Spotfin Porcupinefish joined the party. Since I had already caught one, I gave Michael first try at it. The fish refused his suspended chunk of squid. I decided to try for it and it rather fancied my squid that was resting on the bottom. 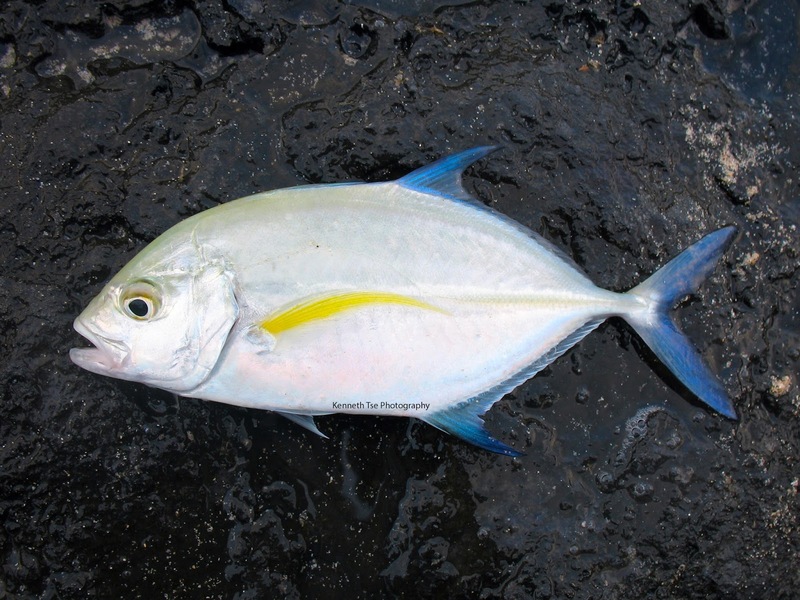 I returned to bread fishing and was merely feeding the fish until the last drop when I finally hooked a juvenile Yellowfin Surgeonfish fairly. To top off a fun afternoon session, we saw a great sunset (as always) near Hawaii Kai. Todd originally planned to take me out on the boat but there was a fuel leak, so instead he took me to North Shore to watch the winter surf. 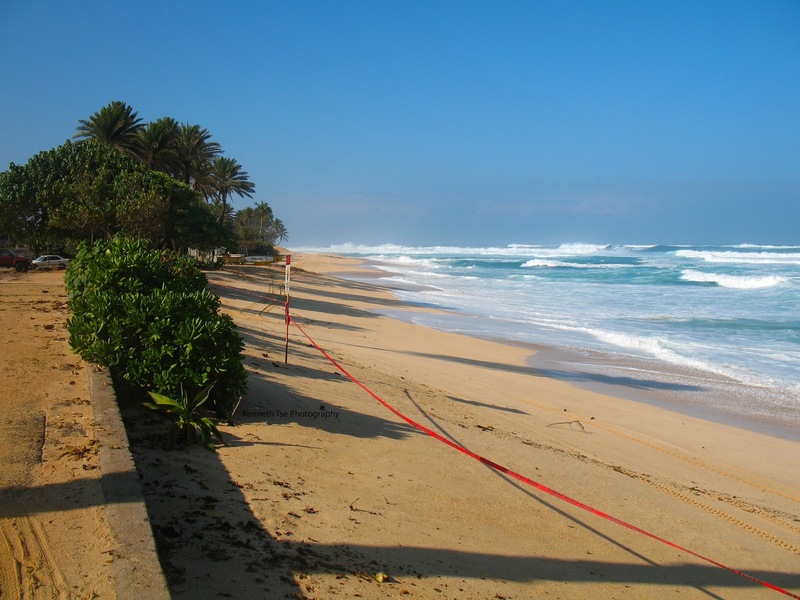 Many beaches were closed due to the very dangerous condition. 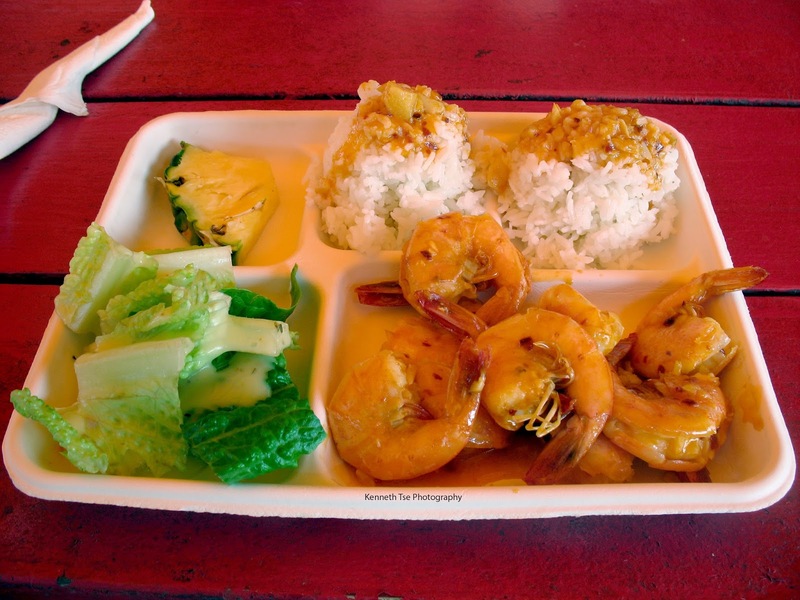 On the way around the northeast coast, we stopped at one of the famous shrimp trucks for brunch. 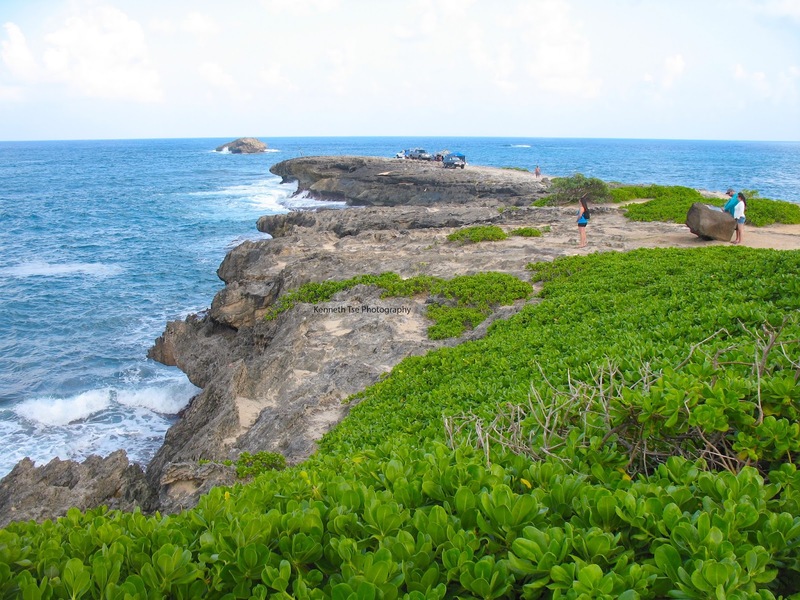 We went to check out Laie Point, a famous ulua fishing ground. 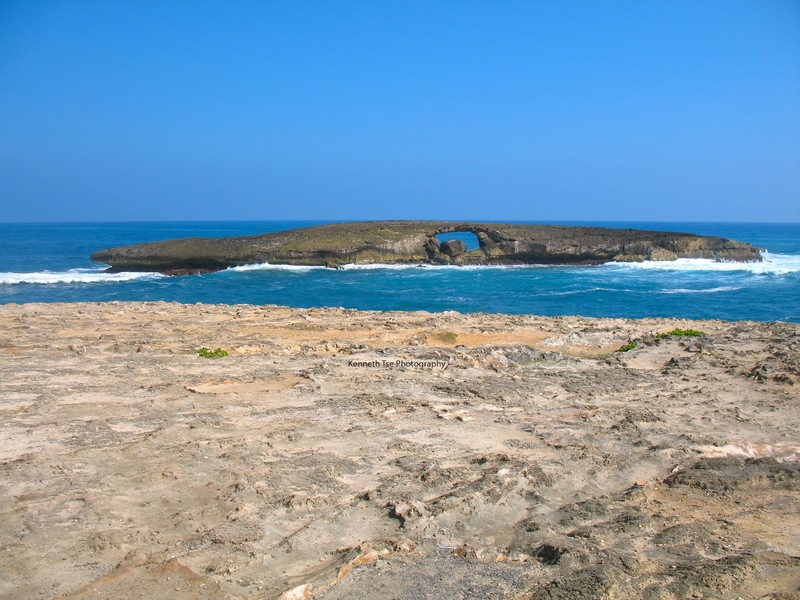 Many will recognize the iconic hole in the island with a large boulder inside. After the circle island tour, I was busy until later in the afternoon. 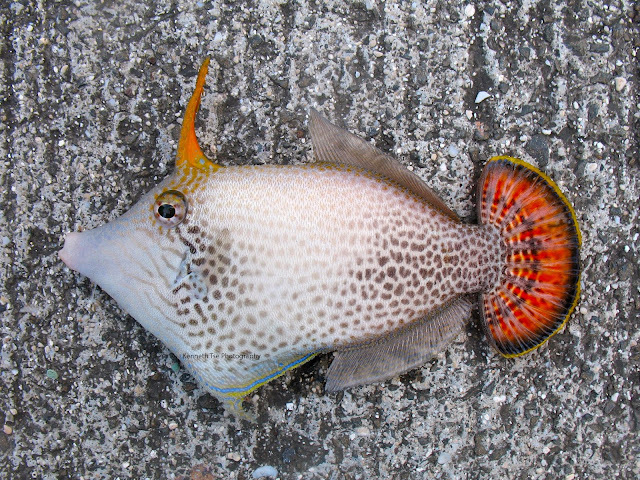 Hoping to catch a Lagoon Triggerfish or Yellowstriped Goatfish, I returned to Makai Pier for a couple of hours. I soaked a strip of squid on the surf rod while fishing bread on the light rod. 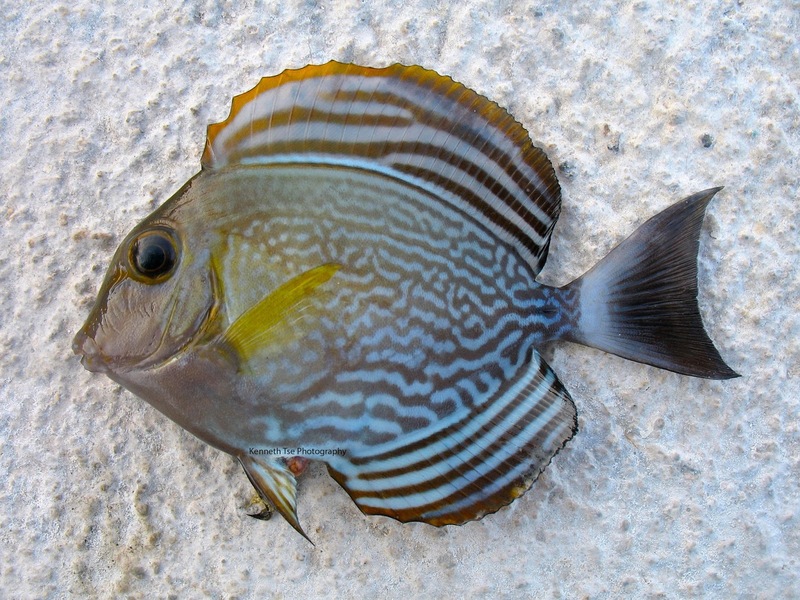 The Lavender Tang and Goldring Tang did not want to bite, but caught a juvenile Common Parrotfish, aka Palenose Parrotfish, instead. 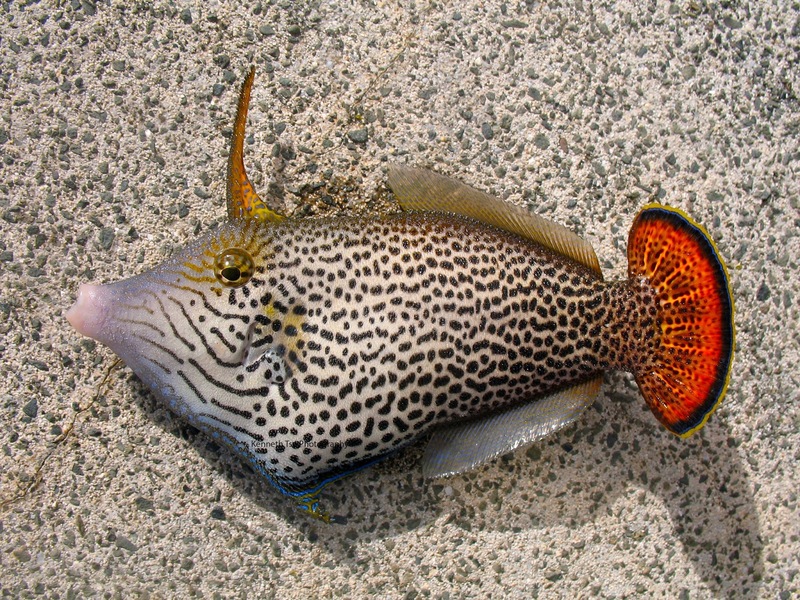 The Millet Butterflyfish and Green Damselfish became too overbearing after a while and I had to quit using bread. 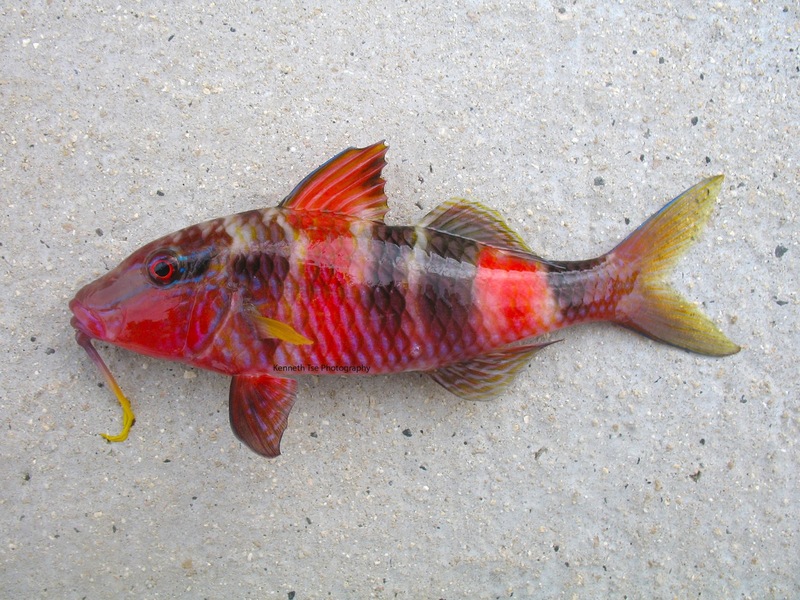 I tried with shrimp for Yellowstriped Goatfish but could not get a bite. A turtle fancied my squid instead and I had to break the line when it became hooked. Finally, I had the leave the pier at 5pm but decided to fish the beach before going home. On the first cast, my shrimp was bit and the line was snapped promptly. There was something larger around. I tried again with 4lb fluoro and #20 hook and caught a Wedge-tail Triggerfish followed by this Bluefin Trevally. As time was running out, I fired a last cast as far as possible and steadily retrieve the bait back when it was hit. 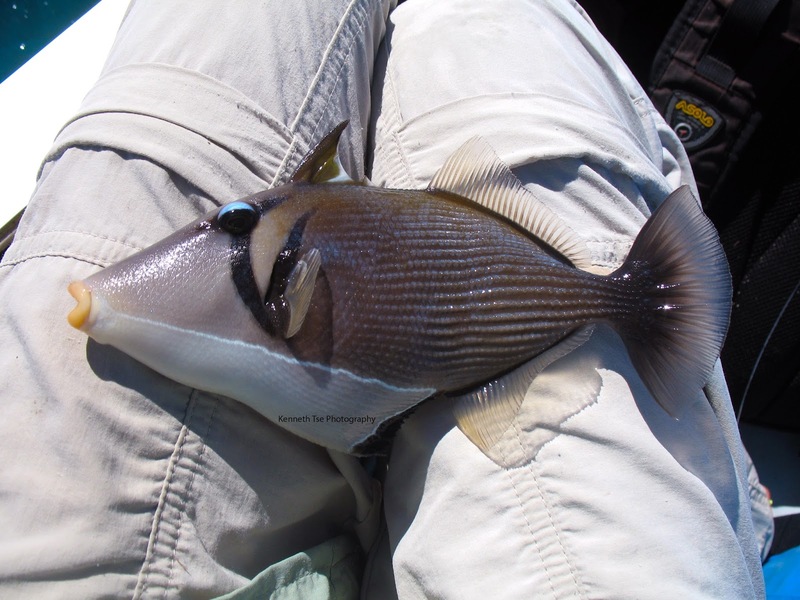 When the fish finally came close to shore, I was shaking as there was a very real threat this White-banded Triggerfish, aka Lagoon Triggerfish, could cut through the 4lb line with its teeth. Luckily, fate decided that I would be adding this species on the list! I only had a couple of hours free today even though my meeting with Stan was canceled last minute. Looking for something close and quick, I went to Ala Moana for a short late afternoon session. I saw a Trumpetfish (Nunu) and a Manybar Goatfish (Moana), and a few Moorish Idol that did not want to bite. I was simply poking the bait around when a female Whitespotted Boxfish took interest! Further down the rocks, I saw some Lavender Tang but the Green Damselfish swarmed the bait and the Lavendar Tang could care less. 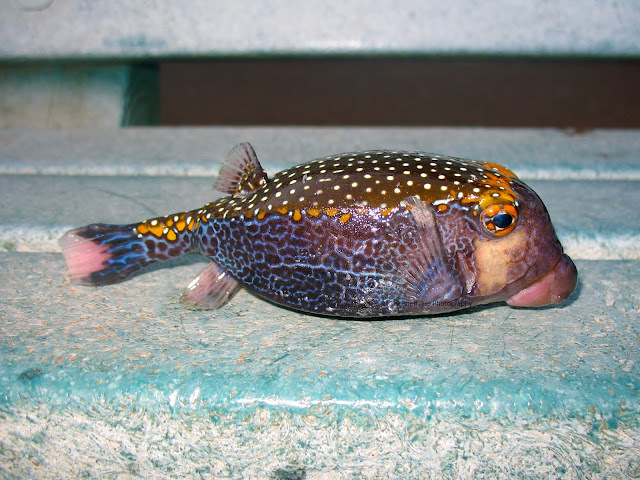 There were a couple of male Whitespotted Boxfish around and I finally got one to take interest. The sun was setting and I decided to go. I tossed a piece of half used shrimp away only to see a large fish picked it up. With my heavier 9' surf rod, I put a new shrimp on the rigged #8 hook and saw the large fish ate it but the hook was cut clean in half. 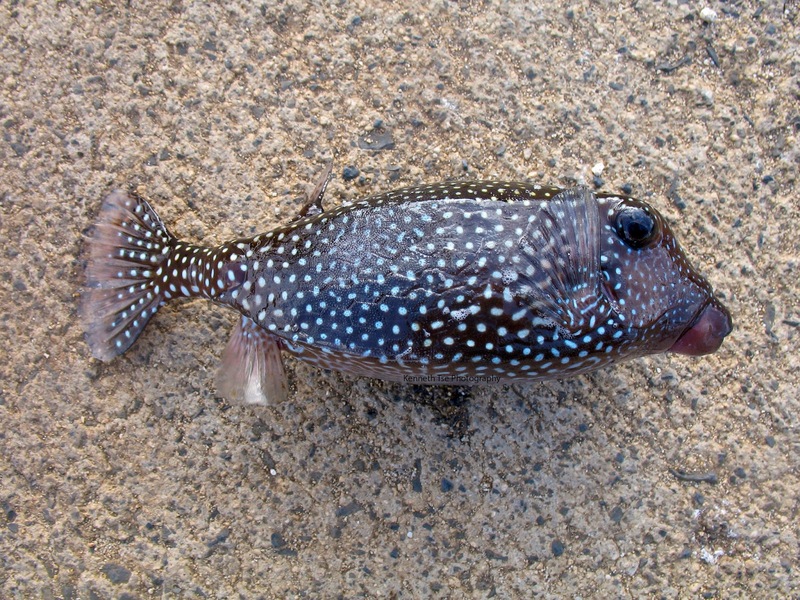 I had previous encounters with Porcupinefish in Hawaii; and suspected this was yet another Porcupinefish taunting my fishing ability. Once upon a time, I had one crushed my hooks repeatedly until I finally put on a metal leader and a large hook to hook it, only to lose the fish when the 8lb line snapped as I tried to lift it up a jetty. Taking no chance at all, I rigged up with 20lb fluoro and #2 hook with a whole shrimp. This time, the fish couldn't cut the hook or the line and I finally had redemption on this species...15 years in the making! Ji had a few hours off and this was the last chance I could fish with him before he hosted his visiting sister. We decided to try Alan Davis after having breakfast. 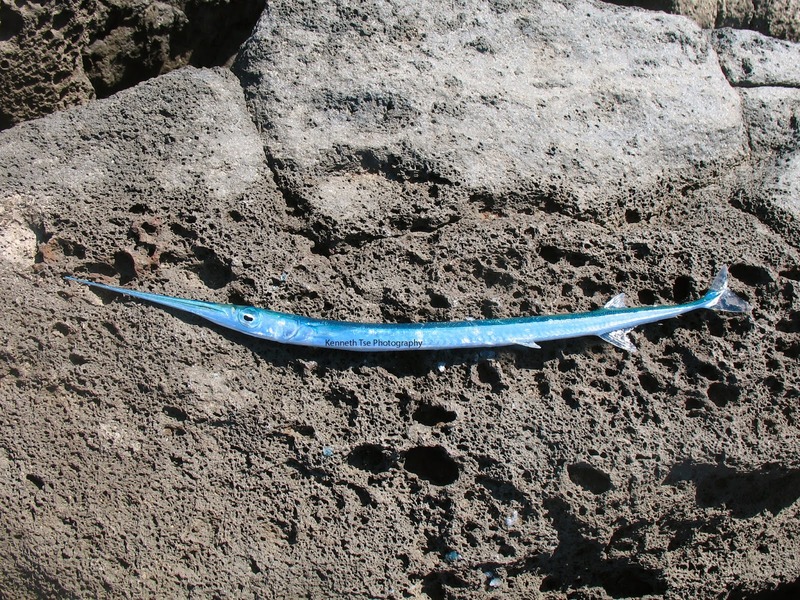 There were many Keeled Needlefish around, which Ji promptly caught a few but it took a while for me to hook and land one. The usual parade of reef species were there - Green Damselfish, Hawaiian Gregory, Saddle Wrasse, Reef Triggerfish...etc. I decided to use chunks of Needlefish to try for Moray in the rock. It didn't take long to find one hunting out in the open, which I hooked but quickly lost when it went into a hole. It might have been a Yellowmargined Moray. As I was poking in the rocks, there were many small red fish grabbing the large chunk of bait. I returned with small hooks and squid and quickly caught one. It poked me with one of its dorsal spine during photography and the thumb throbbed for over an hour. Their poisonous spine was no joke. I kept searching for Moray until a large head came out of a hole in the boulders. It was easily a Moray around 4 feet long. It grabbed the bait and quickly ran back into the hole. I had the eel on the rod, but decided to try to pull on the line by hand to pull the eel out. Eventually the 60lb leader was abraded enough and the line snapped. The eel decided it had enough and it never returned again. 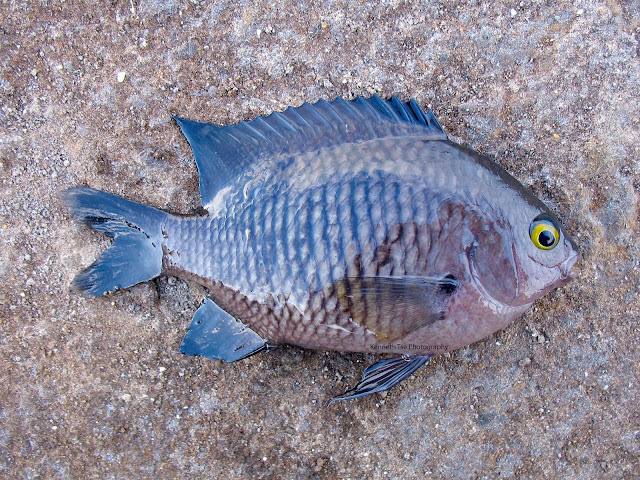 Before leaving, I stopped at a tidepool to catch a Blackspot Damselfish (Kupipi), but those that I found would not bite. Luckily, a very willing little fish came out to surprise me. On our way back to Ji's house, we stopped at a stream where Ji had seen a species of native Hawaiian stream Goby, known as O'opu Nakea, and tried to catch some. 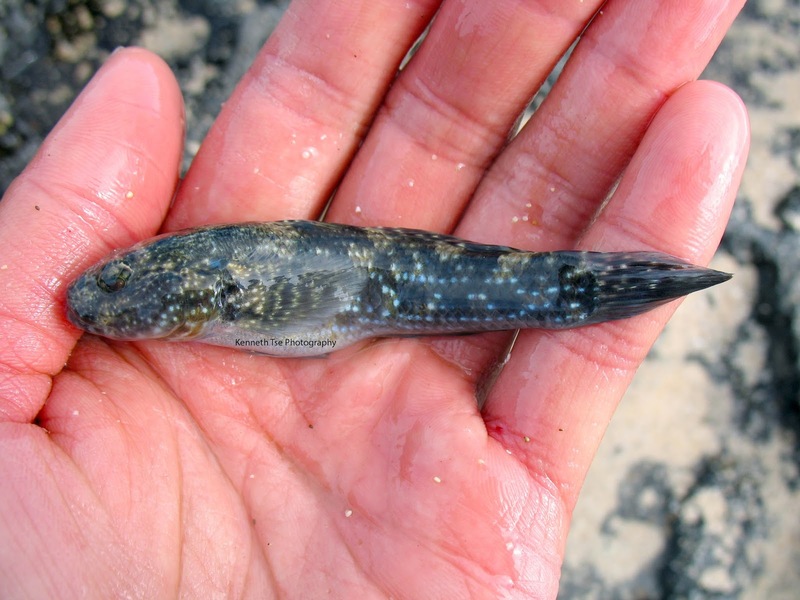 These stream Goby are notoriously difficult to catch since they feed predominantly on algae. They completely ignored our presentation of shrimp, squid and o'pae (native freshwater shrimp). However, I did finish the session with one new bonus species. With a few hours free in the afternoon, I fished solo at Makai Pier again. The light lines and small hooks were very effective, so I spent most of the time using 2lb test and #26 or New Halfmoon hooks. By chance, there was a half a piece of shrimp on the pier that was still fresh. It was a lucky find as the fish favoured shrimp over squid. 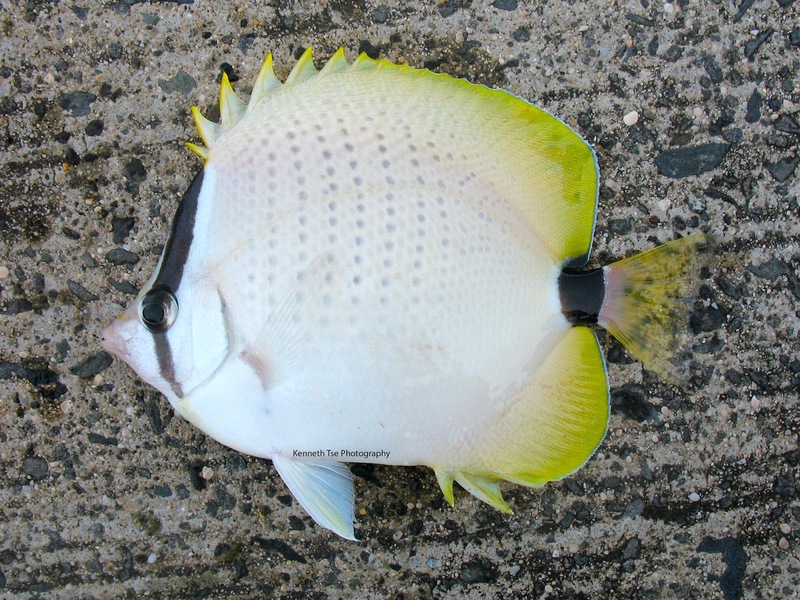 I had most trouble catching Butterflyfish in the past, but this time they were relentless. 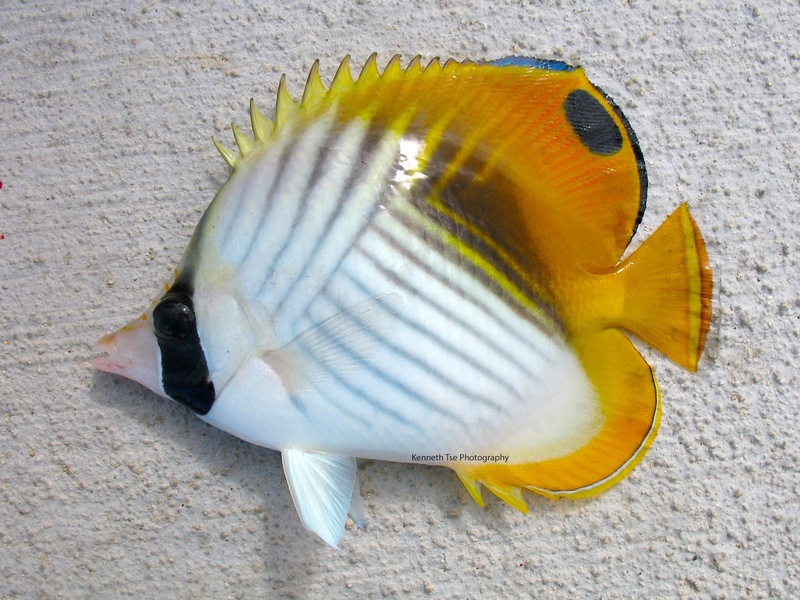 Millet Butterflyfish were very eager, and Threadfin Butterflyfish were not difficult as long as you can get the bait past all the Millet Butterflyfish, Green Damselfish and Saddled Wrasse. After catching those Butterflyfishes, they became annoying bait thieves. 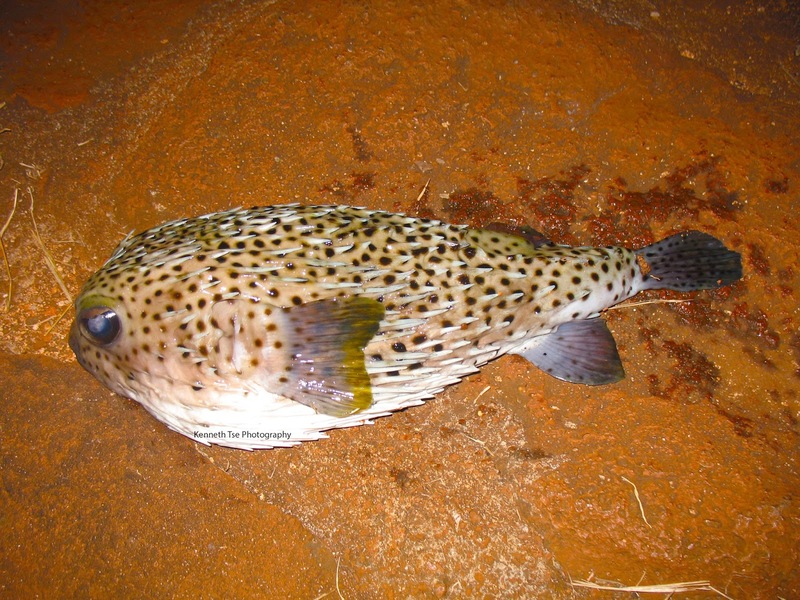 Yes, they are beautiful, but they swarm a bait, any bait, way too quickly...just like this Fantail Filefish. I saw a few Bird Wrasse and they would always hit unexpectedly. 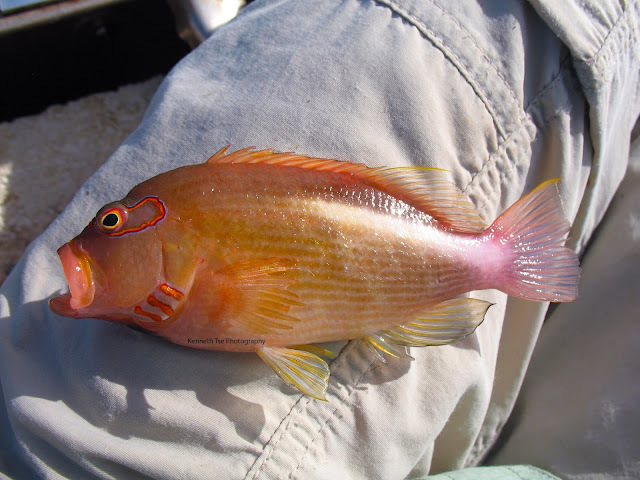 I lost a couple when it appeared I finally had one on the hook...until my old nemesis, the Manybar Goatfish, appeared at the end of the line. 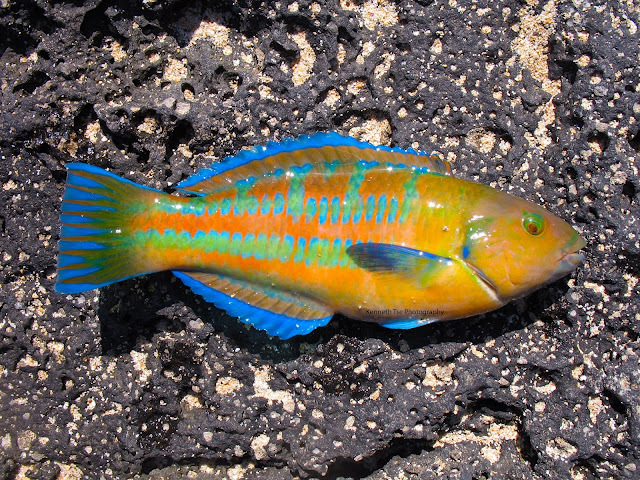 After losing one more Bird Wrasse, I finally got my lifer. There were many Hawaiian Dascyllus suspended over coral. For some time, I could not figure out how to catch them since suspending a bait over the coral simply encouraged the other bait thieves to steal. Finally, I found out that they simply wanted the bait close to the bottom. A local was leaving and gave me some bread for bait. 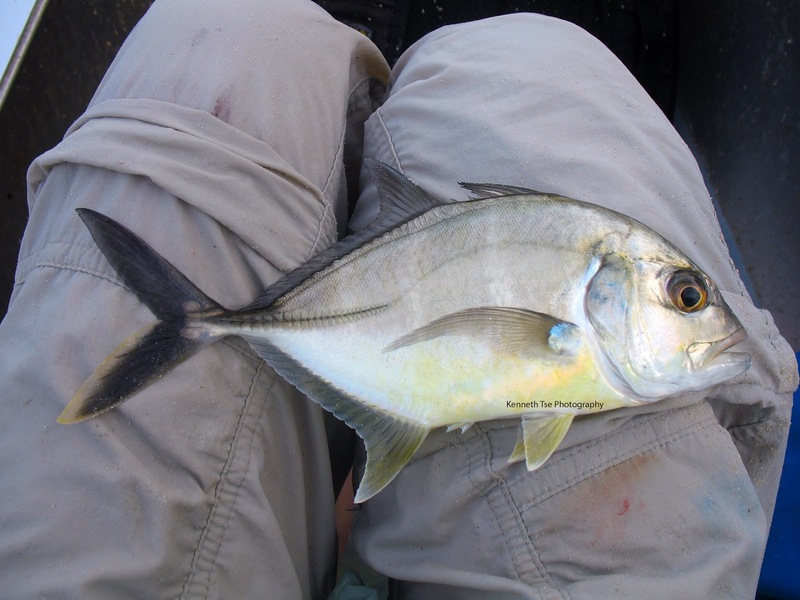 I tried to target some reef fish and found a couple of Goldring Tand and Lavender Tang willing to bite, but all I could do was hooked one each and the hook came off during the fight. 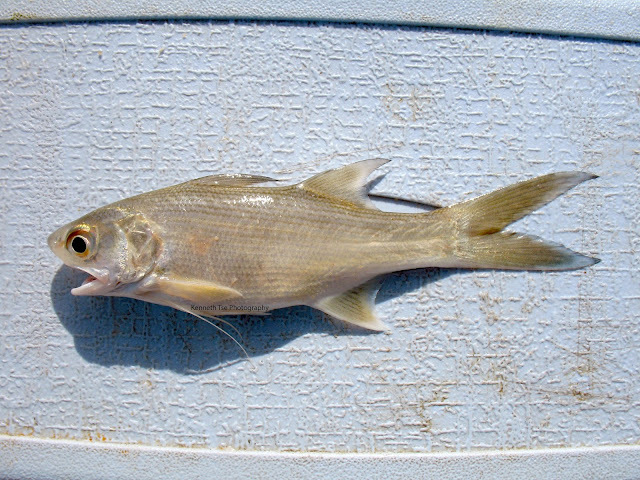 The Goldring Tang was probably one of the hardest fish to catch on hook and line, so that was a major loss. 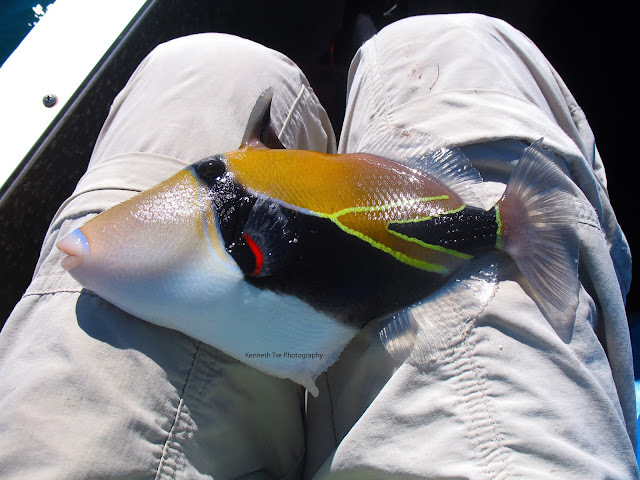 I saw someone catch two Lagoon Triggerfish and tried for a bit for them. 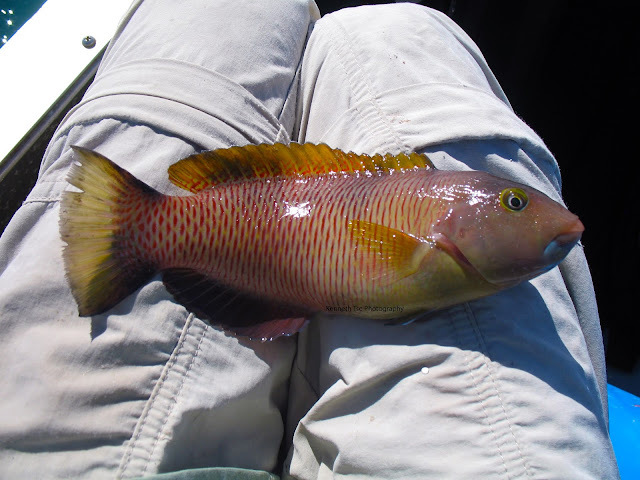 There were also Yellowstriped Goatfish that I could not catch. 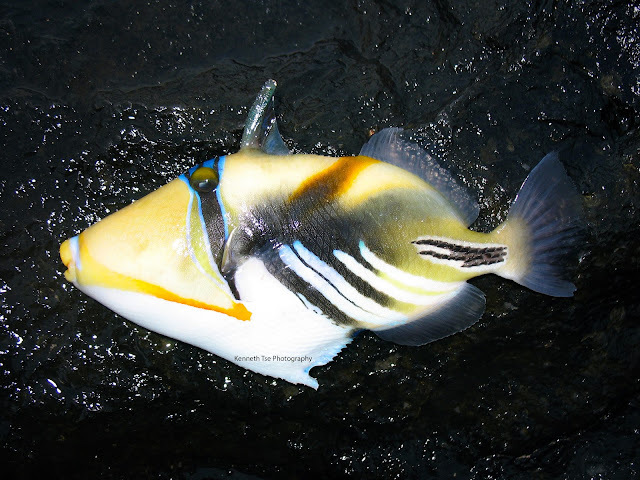 The Moorish Idol and Teardrop Butterflyfish continued to ignore my efforts. I only had a couple hours free this afternoon. Instead of exploring a new spot, I fished Makai Pier. I had fished this location many times on previous trips, but I was more focused on catching predatory fish in the past. This time, I used #26 hook to try for the reef fish and caught many Saddled Wrasse, Green Damselfish and Reef Triggerfish. I tried for Moorish Idol, the various Butterflyfishes, Tangs and Parrotfishes but they would not bite. Just before the pier closed, I finally caught a lifer Fantail Filefish. A small Pufferfish bit off the hook my 2lb line and I decided to end the session on that note. 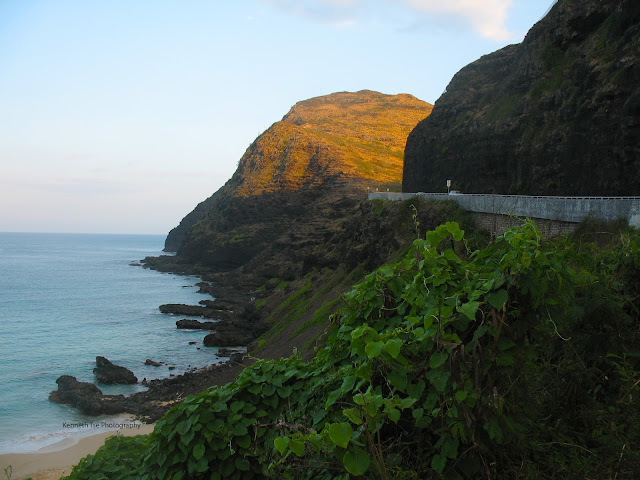 A couple of evening shots of Makapu'u point and the beach. 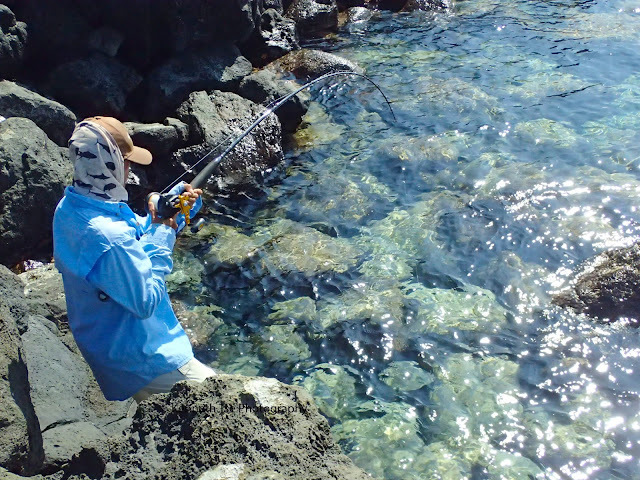 Jason had the morning off and we arranged to fish at China Walls and Makapu'u. As opposed to my previous summer visits, it was calm with only 1.5ft swell with 5kt wind. 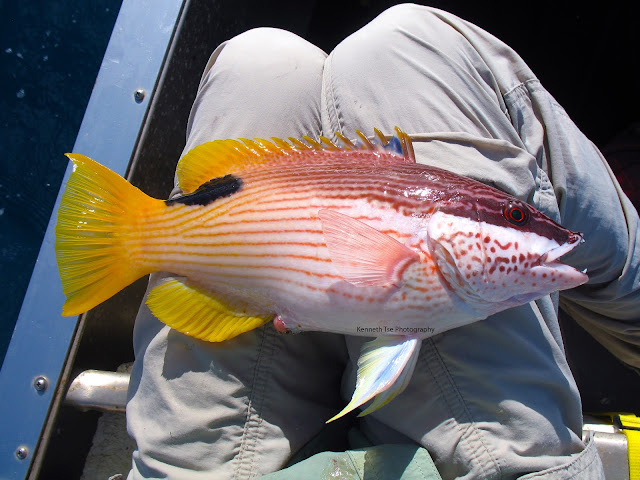 Jason was popping for papio for a while and then switched to whipping, with which he caught a Manybar Goatfish. I tried whipping squid strip and had one follow. Afterwards, I switched to 1/2oz micro fish finder rig with #20 hooks and ika (squid) for bait. I caught a few Hawaiian Gregory and Saddled Wrasse, but lost a potential lifer Fantail Filefish and a species of Sea Chub (Nenue). Here's a picture of the Hawaiian Gregory. With not much going on at China Walls, we went to fish the Makapu'u area. Fishing a tidepool, I found some gobies and blennies. I had to use #26 hook and 2lb fluoro since these fish had fairly small mouths. The Cocos Frill-goby was very eager, but it took me quite a bit of time before the cautious and spooked Rockskipper finally took the hook. 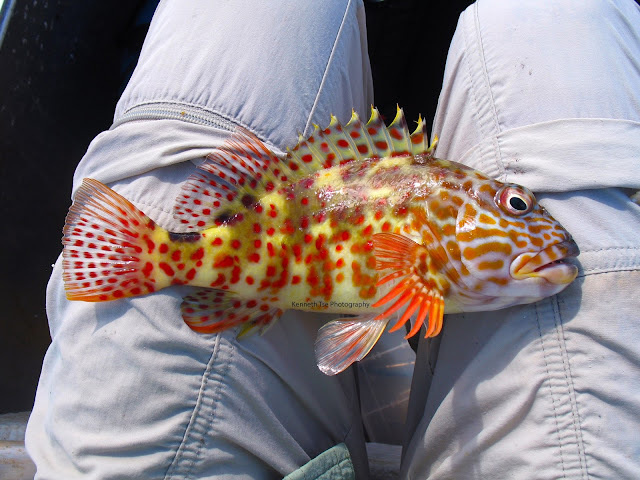 * The Cocos Frill-goby is almost indistinguishable from the related Whitespotted Frillgoby. The Cocos Frill-goby has 10-12 predorsal scales nearly reaching upper edge of preopercle; while the Whitespotted Frillgoby has 15-20 predorsal scales nearly reaching the eye. * The Rockskipper can be confused with the Zebra Blenny. 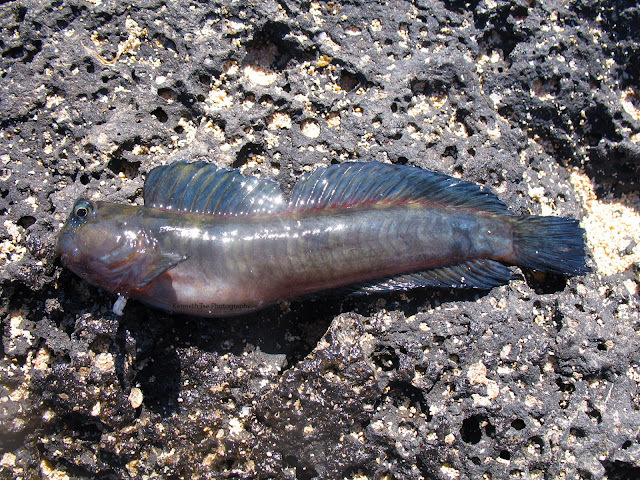 The Rockskipper lacks the nuchal flap; while the Zebra Blenny has the nuchal flap. Fishing the micro fish finder rig again, I caught more Hawaiian Gregory, Saddled Wrasse, Reef Triggerfish, Rainbow Wrasse, and finally a lifer Surge Wrasse! * The female Surge Wrasse is almost indistinguishable from the female Christmas Wrasse. 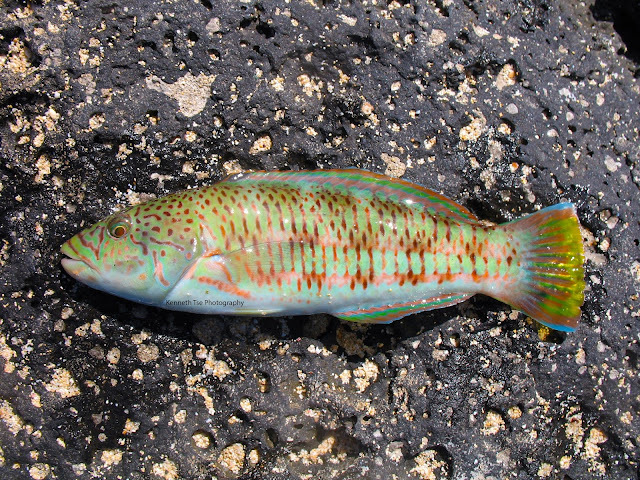 Surge Wrasse has a longer head, shorter pectoral fins, and a "V" mark on the snout; while the Christmas Wrasse has a shorter head, longer pectoral fins and lacks the "V" mark. 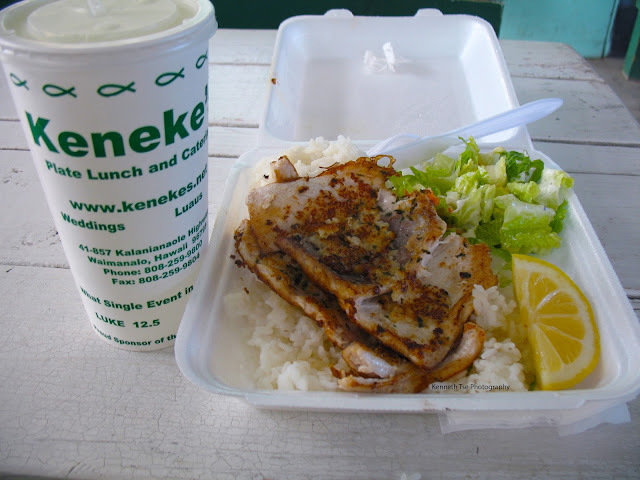 As usual, Jason took me to Keneke's, our regular spot for plate lunch. I ordered the garlic fish (mahimahi) which was super affordable, absolutely delicious and completely filling even for my big appetite. My friend Ji invited me to fish on his 17ft canoe that he custom outfitted with an outrigger. As we were rigging up rods before launching, I found a chipped guide on my 7' Rapala Baja rod. I would be down a rod for the rest of the trip. In Ji's expert hands, we headed out of Kailua Beach into 4ft swells and 15kt onshore wind powered by a 2.5hp 4 stroke engine. 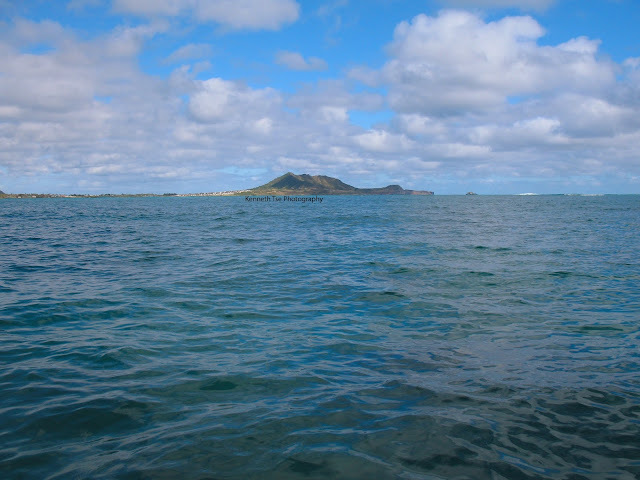 We wanted to troll around the weather buoy but it was too rough, so we trolled to our bottom fishing spot hoping to pick up a Kawakawa but none wanted to play. Once we arrived on location, we set up our rigs with a sliding 1oz egg sinker, a 3' leader and a #8 hook. I tried to go with lighter line but the triggerfish quickly snipped off my hooks. At the end, I found that 20lb provided enough sensitivity and prevented bite offs adequately. The new species came quickly and all of them love the ika (squid). 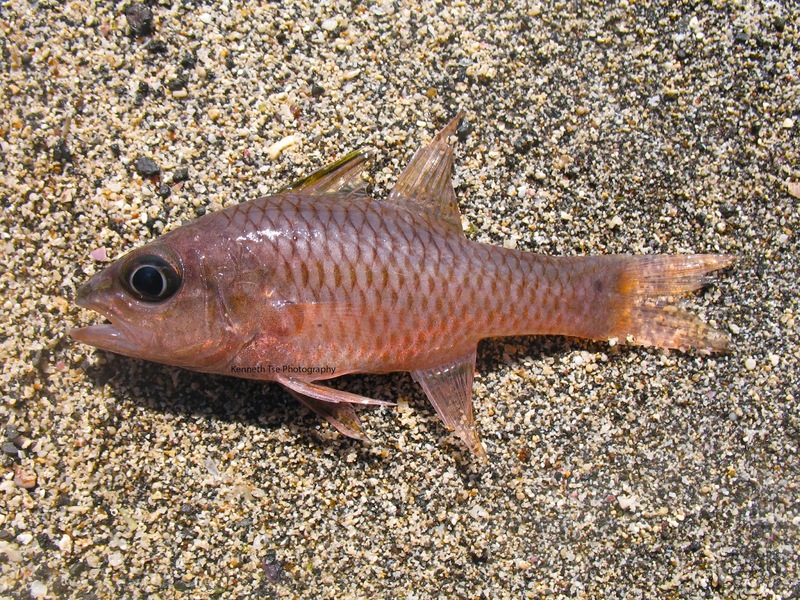 * The Manybar Goatfish had been my nemesis for a long time. I had tried previously over 3 trips to Hawaii to catch one, but could not catch one even when my friends beside me caught them. They are now a common catch for me after catching the first one. 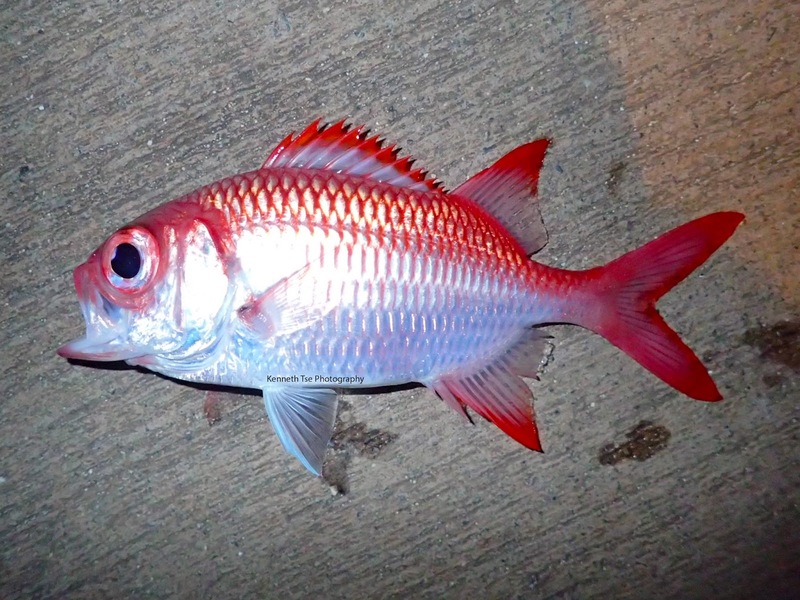 Ji also caught a Bluestriped Snapper, a Cigar Wrasse, a Hawaiian Chub and a Bluefin Trevally. On the way back, we trolled in the canal and found a couple of juvenile Giant Trevally and juvenile Great Barracuda to cap of a fantastic session.